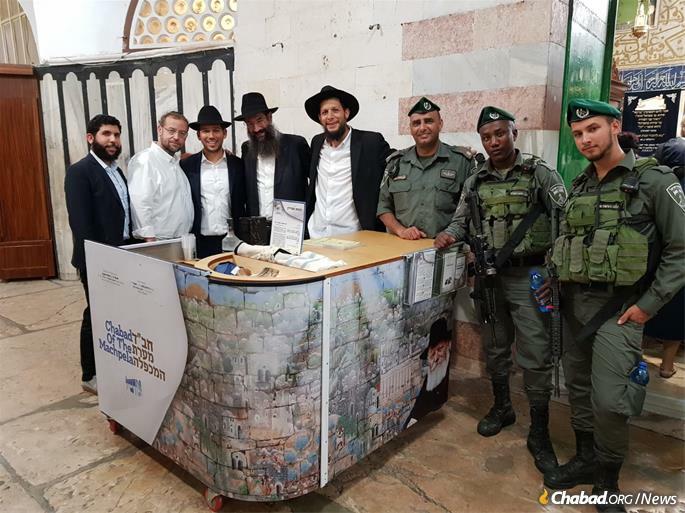 Chabad of Hebron has served tens of thousands of IDF troops stationed in the historic, holy city. With an obvious lump in his throat, a new recruit to the Israel Border Police shared over a break in Safed this past Shabbat that he knew one of the two soldiers laid to rest only a day earlier after being gunned down by a terrorist at a West Bank bus stop. In a thinly disguised effort to assuage his heartache, the young man, who will remain unnamed for security purposes, shared that an elite IDF unit was already closing in on the perpetrator, and it wouldn’t be long before he would be brought to justice. 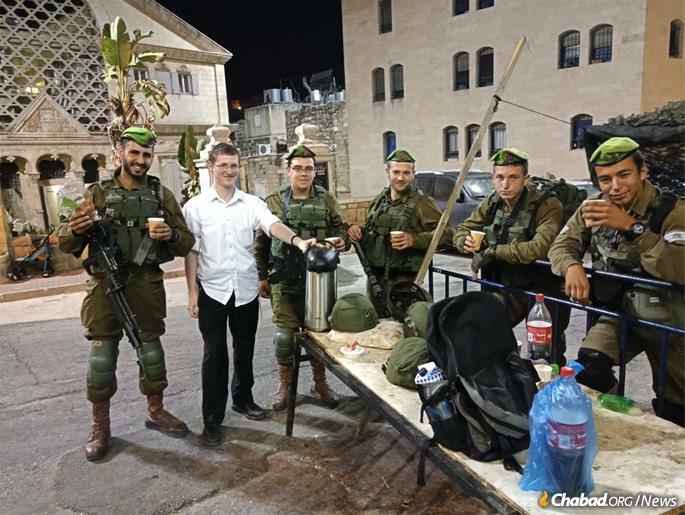 But his eyes lit up when he noted he would be returning to his base in Hebron right after Shabbat, where he alternates devotedly between guarding the Me’arat Hamachpelah, the Cave of the Patriarchs, and the general Hebron area. 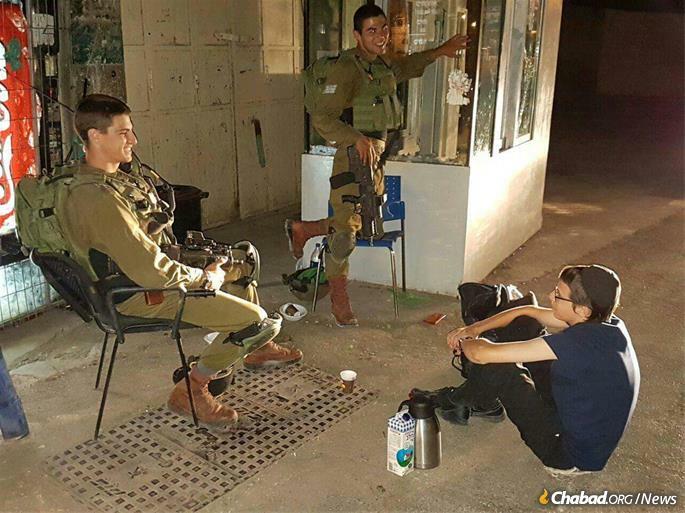 While Hebron is not a cakewalk for any soldier in terms of tensions and prevailing threats, especially with the recent spate of terrorist acts against soldiers and civilians, he said that the assignment is cushioned by the presence of one Rabbi Danny Cohen, who with his wife, Batsheva, have been providing a spiritual and emotional buffer for soldiers there for the past 16 years as Hebron’s head Chabad-Lubavitch emissaries. Now with a look of relief and admiration in his eye, the 19-year-old member of the unit known in Hebrew as “Magav” (border guard) then told Chabad.org how Rabbi Cohen—with the help of local rabbinical students and at least one of the five emissaries on staff at Chabad of Hebron—makes the rounds to every area outpost, checkpoint and base before Shabbat and Jewish holidays to make sure that the soldiers are buttressed emotionally, spiritually and materially. The program comes complete with the delivery of extra rations of cake, coffee and candles for Shabbat, Jewish song and dance. Sometimes, a hot cup of coffee and some friendship is just what a soldier on duty needs. “It is really quite amazing what they do,” he said. Supporters of those efforts are seeking to raise $613,000 in a 24-hour online drive beginning Wednesday, Dec. 19, at noon EST. To participate, visit their donate page here. 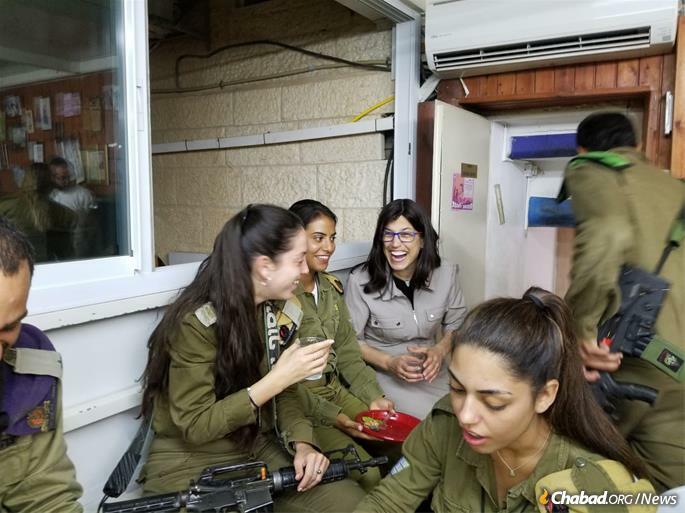 The Cohens, who arrived in 2002, also serve the local residents and the thousands of tourists who stream to Hebron each year from Israel and around the world, but it is the work with the ever-changing shifts of male and female soldiers that have earned them their widespread reputation. Upwards of 500 troops reside there at any given time. Every four months, the rotation changes, so that over the years, thousands upon thousands of soldiers have had their lives touched by the Cohens and their dedicated staff in different ways. 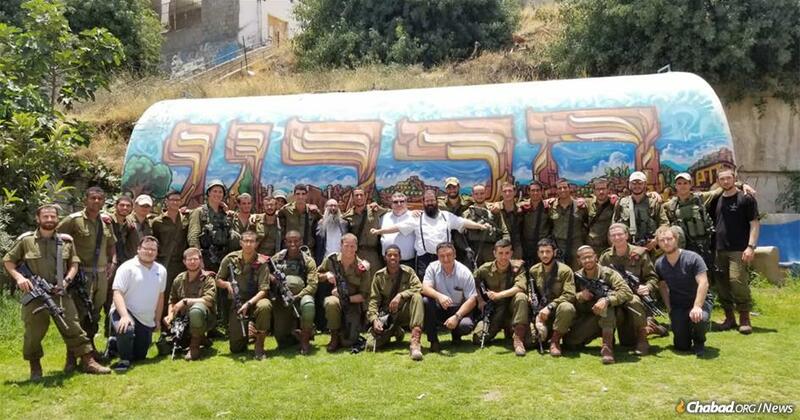 For Rabbi Cohen, who served in the Givati Brigade—and whose oldest son of six children is training to be an IDF paratrooper—helping soldiers materially and spiritually has additional meaning. In many cases, it is the first time that some of these stalwart young Israelis have had any exposure to Torah Judaism. Among the offerings are Torah classes, and to some of the soldiers, this represents their first exposure to traditional learning. 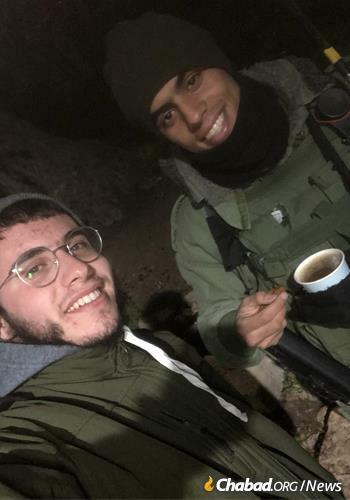 Of the many yeshivah students in Hebron, there are always two boys who make the rounds of the bases, helping soldiers put on tefillin, while another of the emissaries staffs a permanent tefillin booth and coffee corner at the Cave of the Patriarchs. 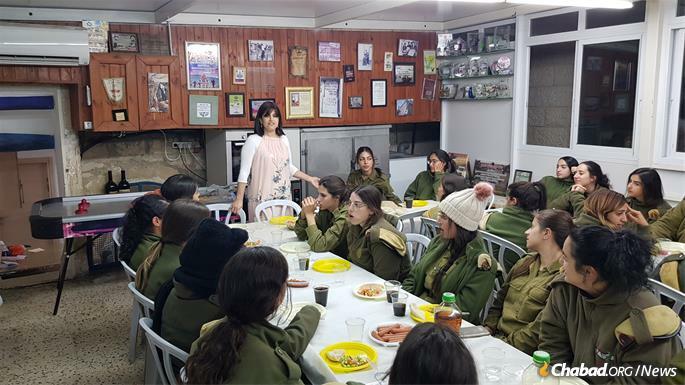 Batsheva Cohen leads classes for women soldiers. Hebron Chabad history, though, goes much further back, he said. In 1844, the granddaughter of the first Lubavitcher Rebbe, Rabbi Schneur Zalman of Liadi, and daughter of Rabbi DovBer, the second Lubavitcher Rebbe, known as the Mittler Rebbe, Rebbetzin Menucha Rochel Slonim, left Russia together with her husband, Rabbi Yaakov Kuli Slonim, to fulfill her dream of living in Hebron. As matriarch of the Chabad community, she would receive guests in her home, which became known as Beit Schneerson (“Schneerson House”). Known for her piety and wisdom by Jews and Arabs alike, she gained a reputation as a sought-after spiritual counselor and provider of blessing to many. She died in her 90th year in 1888 and is buried in the old Hebron cemetery, where a kollel in her name has been established since. Bringing family to soldiers away from home. In 1878, a wealthy Turkish Jew by the name of Chaim Yisrael (Mercado) Romano built a palatial home and guesthouse that was eventually known as Beit Romano. In 1901, the renowned Sephardic sage, Rabbi Chaim Cheskia Medini—the Sdei Chemed—arrived to live there and established a yeshivah. Learning that the Romano family was interested in selling the property, the Sdei Chemed offered it to the fifth Lubavitcher Rebbe, Rabbi Shalom DovBer Schneersohn—the Rebbe Rashab—where he established the Yeshiva Torat Emet. Fast-forward to further notable activity and ongoing community-building in the most recent of times. For the last three years, the Cohens have erected, with the help of an anonymous donor, the massive Chayei Sarah Tent to accommodate in style the thousands of visitors who converge on the city annually on the Torah portion of that name to eat and celebrate. The portion contains the famed story of Abraham buying from the then locals the burial plot for his deceased wife, Sarah, that would also become the tombs for all of the Jewish patriarchs, including Abraham, and the matriarchs except for Rachel, who is buried near Bethlehem. 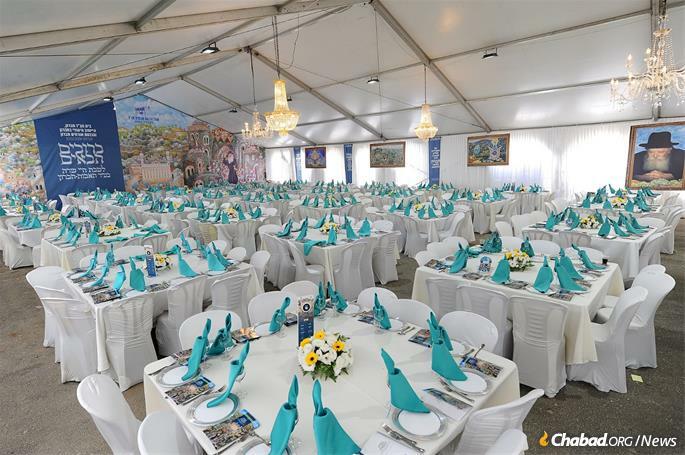 Once a year, on Parshat Chaya Sarah, a massive, lavish hospitality tent is erected for the many visitors who travel to Hebron. Having a laugh with the troops. Chabad rabbinical students help out throughtout the year.